I am on a mission to raise the awareness of everyday, non-technical people on the crucially important topics of cyber-security and online privacy. There are plenty of resources for computer geeks (like me), but I’m striving to reach the 99% of the population who use the Internet all the time but have no real idea how safe they are nor how to make themselves safer. It might seem like a lost cause, but trust me, it’s not! There are dozens of free and simple things we can all be doing to protect ourselves, our family, and our friends. All of this started with the publishing of my book, Firewalls Don’t Stop Dragons, now in its third edition. I always wanted to write a book and I’ve always had a knack for explaining complex technical subjects with simple analogies and plain English. When the Edward Snowden bombshells dropped in 2013, it all crystallized for me: I needed to help people understand why computer security and online privacy are important – not just individually, but for any healthy democracy – and tell them what they can do to improve both. The book has well over 150 tips and techniques for mitigating or eliminating cyber-weaknesses, online tracking, mass surveillance and general hackery. I am the host of the podcast Firewalls Don’t Stop Dragons. The podcast is released every Monday, featuring the week’s most relevant cyber-news and interviews with knowledgeable guests – all geared towards regular, everyday, non-technical people. You can find the show on iTunes, iHeartRadio, Stitcher, Google Play, and other podcast and streaming radio venues. As if all of that weren’t enough, I also publish a bi-weekly newsletter of timely cyber-security and privacy tips. My goal is to keep it short and to the point, with links for you to dig further and learn more if you have the time. You can sign up for the newsletter here. When you sign up, you will receive my booklet Carey’s Top 5 Security Tips for free. I will never give our your email address to anyone else (privacy is sorta my thing). Carey Parker was born and raised in Indiana, an only child who loved to tear apart his electronic toys and reassemble them in interesting ways. He began programming computers in middle school when personal computers were just starting to become popular. For years, these twin interests percolated until he attended Purdue University and he learned you could get paid to do this stuff – it was called Electrical Engineering! After obtaining a bachelor’s and a master’s degree in EE, Carey launched his career in telecommunications software development at Bell Northern Research (aka the “Big Nerd Ranch”). 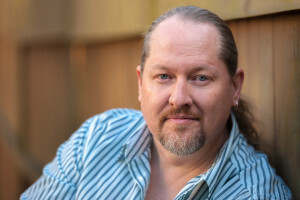 Over the next 25+ years, Carey wrote software for multiple companies, large and small, and lived in various cities across the southern United States. In recent years, particularly after the Edward Snowden revelations in 2013, he became deeply concerned about computer security and online privacy. In 2014, he combined his passion for computers, cyber-security and fantasy novels with the long-time desire to write a book: Firewalls Don’t Stop Dragons.